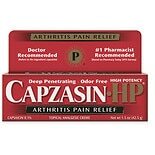 Shop Capzasin HP Arthritis Pain Relief Creme (1.5 oz. )1.5 oz. $1599$15 and 99 cents$10.66 / oz. 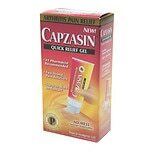 Shop Capzasin Quick Relief Gel (1.5 oz. )1.5 oz. $1079$10 and 79 cents$7.19 / oz.